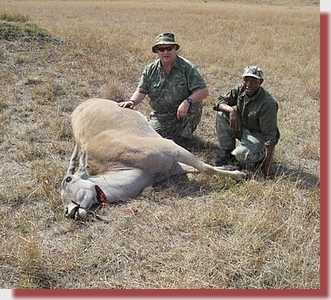 Selwyn Low from Newcastle, South Africa, submitted the following during the 2008 hunting season. I thought that you might like to see and hear about the results I got recently. I used my 375 H&H on an Eland hunt 2 weeks ago. I have been using your 265 gr HV bullets for a long time now, but have never been able to recover one. 2 Weeks ago I was lucky. I took an Eland cow at 182 m and managed to recover the bullet. It was probably one of the most perfect performances I have seen on a bullet. Weight retention was 100% which says a lot. The shot was side on and was a perfect heart shot. The cow wobbled away for about 6-8 metres and fell over. 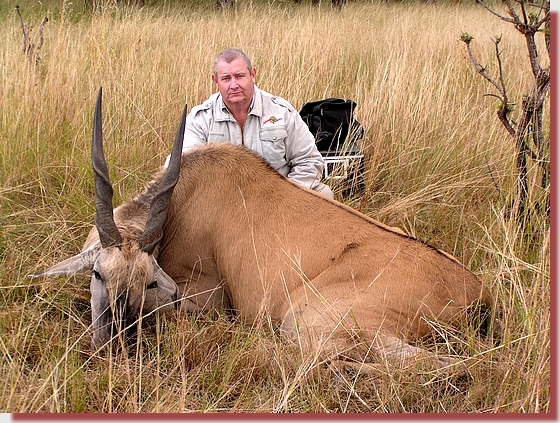 A year ago I also took an Eland Bull, (see photo), with a shot through the neck. It fell right there but I could not recover a bullet. Your product is great and I am sure is there to stay!